The XXII Winter Games, in Sochi, begin on February 7th and go until February 23. With just over two weeks of winter sports and athletic showmanism, it’s hard not to get excited. Though I’m mainly looking forward to the hockey games, especially since so many of my beloved Chicago Blackhawks are representing their various countries, there is also a slew of solo events to get your pulse racing, like skiing, ice skating, or snowboarding. 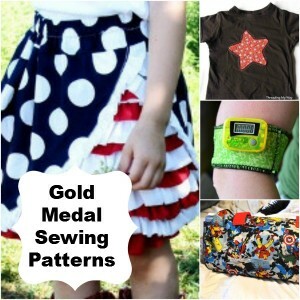 In honor of the 2014 Winter Olympics, AllFreeSewing is here to inspire you with a fabulous collection of gold metal projects! Whether you want to show off your patriotism as you root for America, or you want to work on getting yourself in tip-top shape at the gym, we have something for you to create. 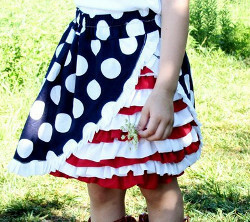 Cheer on Team America with these festive and patriotic sewing projects! These clothing and home decor items are sure to inspire a sense of camaraderie. If you’re visiting us from another country and would be rooting instead for another team, you can easily change the fabric to reflect your country’s colors! Have the competitive events inspired you to become more active and fit in your life? Whether you’re a gym newbie (no shame! We all have to start somewhere) or you’ve decided to finally return to the gym after a short break, these projects are meant to help and inspire you in your journey to the gold! With all the prepping and training you’ll be doing to gear up for the winter games, why not be inspired to host your own mini games? Invite some friends and family over and hold your own contests and events to replicate those in Sochi; you can all go to an ice-skating rink and see who can circle the rink the fastest, or sled-race down an especially big and snowy hill! Or you could gather in a large backyard and come up with relay races and agility tests! At the very end, you can give out DIY medals and awards to the winners. How cute is this Plush Torch and Medal? This great sewing pattern set was created by Cheryl from Sew Can Do! What event(s) are you most anticipating? Crafty-lympics Giveaway: The Final Winner! It has been quite the exciting week with the Olympics wrapping up and the suspenseful competition of our 2012 Crafty-lympics! It sure was a close competition yesterday between the Knitting and Crochet project that faced-off in our Crafty-lympics challenge. I bet you’re dying to know who took home the gold in the Crafty-lympics! Our gold-medal winner of the 2012 Crafty-lympics is Crochet! Congrats to all you crochet fans out there! Your votes earned your craft the gold medal. Speaking of winners, as promised, one lucky voter won a special prize just for voting! So congrats to Crafter 16203, you’re our lucky winner! Thanks to everyone for voting and we can’t wait for the next Crafty-lympics! Today is the last day for our Crafty-lympics. If you’re like all of us here at FaveCrafts, you’re just as excited about the final head-to-head in our 2012 Crafty-lympics competition. Every day this week, we’ve given you crafters the chance to vote for your favorites between two crafts by going to their pages and leaving comments. After the results are tallied, one lucky crafter who posted on the wining project’s page will receive an exciting prize package. The results are posted at the end of each day, so be sure to check this blog daily! If you’re looking to better your chances of winning a fabulous prize package, be sure to submit comments to both project pages. There’s only one prize per day, so pick your favorite and vote before time’s up! We’re only one match-up away from finding out which craft is worthy of gold, and neither team is going down without a fight! “Team Knitting” continues to bring out its best projects, this time with the adorable Cozy Baby Cardigan from AllFreeKnitting. This sweet project is practical for the colder months of the year, but also totally cute and comfortable. “Team Crochet” also shows off its best wearable projects with a Pineapple Crochet Scarf from AllFreeCrochet. This chic and cheeky look can go with almost anything, and is sure to keep your wardrobe both warm and fashionable. We will be awarding one lucky reader an awesome crafty prize pack so vote now! One comment/entry per person per project. Can’t decide on one, comment on both! 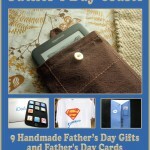 Contest closes August 11, 2012 at 11:59p CST. Please comment on the site of the project you want to win in order to be entered. *Reminder – Comments on this blog post are not counted towards the giveaway. You must click on the projects and comment on the site to be eligible to win a prize. The Craftylympics continue to be full of surprises, as the match-up between Knitting and Quilting ended with a close race between two colorful and comfortable crafts. Which project overcame the odds to continue their fight towards becoming the king of all crafts? Congratulations to all of you knitters out there! You represented your team like true champions and came out with your needles on top! Tomorrow is our final day of competition, and the battle between Crochet and Knitting is sure to be fierce. Vote in today’s match-up to help lead one craft to victory! Speaking of winners, as promised, one lucky voter won a special prize just for voting! So congrats to scottandstacy0203, you’re our lucky winner! Want your chance to win too? Want your chance to win too? Be sure to vote for your favorite craft in today’s showdown! Every vote is a new chance to win every day! There’s nothing more inspiring than seeing people push themselves to new levels within their expertise. It’s one of the best parts of the Olympics, and it’s just as exciting to see crafters do the same. Everyone at FaveCrafts wants to inspire your crafting too, so we’ve created the 2012 Crafty-lympics! Every day this week, two different crafts will be going head-to-head in an unpredictable competition to see which craft reigns supreme! The only way this can be decided is if crafters like you select your winner, click on their picture, and comment on the bottom of their page. At the end of each day, we’ll count the votes and one lucky crafter from the winning craft’s page will receive an amazing craft prize package. The rounds go very quickly, so be sure to check this blog for the daily results! 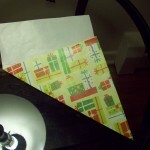 The prize package is perfect for any crafter, so to better your chances of winning, comment on both project pages. We’re only giving out one prize each day, so get your votes in before it’s too late! As we get closer to a winner, each team represents their craft with their fiercest competitors, and both Knitting and Quilting are ready to do their best! “Team Knitting” brings elegance and beauty to this battle with this Claire Lace Shawl from AllFreeKnitting. This gorgeous project complements any style of clothing with a lightweight design that adds grace to every situation, no matter how formal. Don’t count out “Team Quilting”, because they’re bringing out one of their top crafts, an Effortless Tied Baby Quilt from FaveQuilts. This quilt is the perfect addition to your little one’s crib and also makes a great gift for any friends or family members who are expecting a little bundle of joy in the near future. Contest closes August 10, 2012 at 11:59p CST. It sure was a close competition yesterday between the Sewing and Knitting projects that faced-off in our Crafty-lympics challenge. I bet you’re dying to know who won this round of the Crafty-lympics! Moving on to the next round is Knitting! Congrats to all you knitters! You’ll be facing quilting in the semi-finals! Speaking of winners, as promised, one lucky voter won a special prize just for voting! So congrats to Mippy, you’re our lucky winner! Want your chance to win too? Be sure to vote for your favorite craft in today’s showdown! Every vote is a new chance to win every day! The Olympics are in full swing and it’s hard not to be inspired while watching all those amazing athletic feats. It’s too bad that crafting isn’t an Olympic sport, if it was we would definitely be going home with some hardware! Unfortunately, that probably won’t happen, so here at FaveCrafts we’ve decided to channel all our competitive energy into the 2012 Crafty-lympics! Throughout one glorious week of crafting, two projects will be going head to head each day to try to earn your votes. That’s right, it’s up to you to decide which of the two is the king of all crafts! All you need to do is click on the link or picture of your favorite craft and submit a comment at the bottom of the craft’s page. After the scores are tallied, one of the commenters on the winning craft’s site will receive a must-have craft prize package. We’ll announce the winner each day on this blog, so be sure to check back and see if you’re our lucky crafter! You’re going to love our prizes, so to increase your chances of winning, write a comment on both pages. Remember, we’re giving away a prize every day, so be sure to vote all week. If you missed yesterday’s shocking match-up of Sewing vs. Knitting, be sure to take a look at the results (just remember, voting for this match-up has already ended)! The stakes are getting higher, it’s the semi-finals! Which craft, Jewelry or Crochet, has what it takes to succeed? It’s up to you! Our first crafty contender, from “Team Jewelry”, is the chic Shamballa Bracelet from AllFreeJewelryMaking. This stylish bracelet is great for everyday wear and will add glitz to any outfit! If you want the Shamballa Bracelet to win make sure you click on the link or picture and comment on the project’s page. Putting up a strong fight for “Team Crochet” is the beautiful Harvest Color Autumn Tote from AllFreeCrochet. This project is perfect for fall with it’s bold hue and cabled details. It looks like it’s going to be quite the competition, so be sure to vote for your favorite project today! If you want the Harvest Color Autumn Tote to win be sure to click on the link or picture and comment on the project’s page. Contest closes August 9, 2012 at 11:59p CST. *Reminder – Comments on this blog post are NOT counted towards the giveaway. To enter you must click on the projects and comment on the project’s page to be eligible to win a prize. It sure was a close competition yesterday between the Painting and Quilting projects that faced-off in our Crafty-lympics challenge. I bet you’re dying to know who won the second day of the Crafty-lympics! Moving on to the next round is Quilting! Congrats quilt lovers! You’ll be facing either sewing or knitting in the next round. Speaking of winners, as promised, one lucky voter won a special prize just for voting! So congrats to Bobbi Dunn, you’re our lucky winner! I’m so impressed by the level of excellence achieved by all the USA athletes. All that hard work, dedication and sacrifice culminates in one match, one dive, one race. As crafters we understand how much effort it takes to achieve your goals whether it’s getting a gold medal or finishing a quilt. 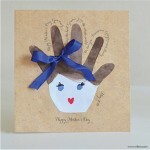 Here at FaveCrafts we are celebrating the Olympic spirit with our 2012 Crafty-lympics! You’re going to love our prizes, so to increase your chances of winning, write a comment on both pages. Remember, we’re giving away a prize every day, so be sure to vote all week. If you missed yesterday’s shocking match-up of Painting vs. Quilting, be sure to take a look at the results (just remember, voting for this match-up has already ended)! Today’s exciting match is between Sewing and Knitting. 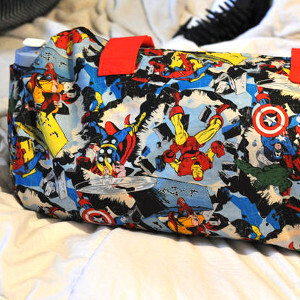 Our first crafty contender, from “Team Sewing”, is the chic Gathered Clutch from AllFreeSewing. This adorable clutch has handy interior pockets and is perfect for storing your cell phone and credit cards! If you want the Gathered Clutch to win make sure you click on the link or picture and comment on the project’s page. Putting up a strong fight for “Team Crochet” is the gorgeous Cantaloupe Scarf from AllFreeKnitting. This project is a great way to add a pop of color to your everyday wardrobe. It looks like it’s going to be quite the competition, so be sure to vote for your favorite project today! If you want the Cantaloupe Scarf to win be sure to click on the link or picture and comment on the project’s page. Contest closes August 8, 2012 at 11:59p CST. What an amazing effort from both our competitors! Yesterday a crochet craft and a paper craft faced-off in our Crafty-lympics challenge. I bet you’re excited to know who won the second day of the Crafty-lympics! Moving on to the next round is Crochet! Congrats crochet lovers! You’ll be facing jewelry in the next round. Speaking of winners, as promised, one lucky voter won a special jewelry prize just for voting! So congrats to TheCrochetLady, you’re our lucky winner!